The purpose of this award is to give annual special recognition to an AG Corps Officer who best understands LTG Maude’s contributions and values in his dealings with Commanders, Soldiers and their Families, and the Army. Any Army Branch 42 Officer. Officer must be in the grade of 2LT – CPT. Nominee must be a member of the active Army, National Guard, or Army Reserve as of 30 June for the year awarded. The annual AG Corps Awards Program MOI provides all criteria for the LTG Timothy J. Maude Medal. The MOI is distributed to major Army command headquarters and S1Net. Contact the AG School Operations Division, (803) 751-8300, if you need a copy of the MOI. Criteria within the MOI is summarized as follows (check annual MOI to validate): APFT (minimum 90 points in each event) within the previous 12 months; Officer Record Brief; verification of height and weight; Weapons Qualification within the previous 12 months; No UCMJ, Suspension of Favorable Actions, or disciplinary action (letter of reprimand, etc. ); one Officer nominee per major Army command as annotated in the annual AG Corps Awards Program MOI; current DA Photo (head / shoulder picture may be substituted if deployed); one page summary from the nominee demonstrating their understanding of LTG Maude’s contributions, values, etc., and how they seek to emulate him; and recommendation narrative from the nominee’s chain of command and the senior Adjutant General officer on that post. Narrative should include an outline of the officer’s contributions that best emulate LTG Maude as a Soldier, leader, and values based person. Include, but not limited to, values, leadership, their role in the Army (tactical and technical), visionary, and most importantly their support of Commanders, Soldiers and their Families. Narrative should not exceed more than two pages. Due to support of deployed operations, some Officers may not have current APFT and / or weapons qualification within the previous 12 months. If the scorecard is not available, a separate memorandum from the Soldier’s Company Commander will be included explaining these circumstances and how the scores were verified. Submit the entire packet electronically to the AG School POC as provided within the Corps Awards Program MOI. For many years the Adjutant General’s Corps Regimental Association (AGCRA) has sponsored the annual recognition of the Adjutant General’s Corps Noncommissioned Officer and Soldier of the Year by bestowing an Association Distinguished Achievement Medal. In 2000, The “John J. Dinnien Award for Excellence in Military Personnel Management” was also sponsored by AGCRA to annually recognize the contributions of Army Senior Civilians and Civilians in military personnel management. The first AG Corps Dinnien Award was presented in March 2001. After the events of 11 September 2001, the AGCRA National Executive Council (NEC) looked at various ways to honor AG Soldiers and Civilians who were killed at the Pentagon. The Association approved and now sponsors two new medals to honor the memory and service of LTG Timothy J. Maude and SGM Larry L. Strickland. Mrs. Teri Maude and CSM (Ret) Debra Strickland viewed the medals and gave their concurrence. In 2003, the Association honored and sponsored both the AG Corps Officer and Warrant Officer of the Year with the LTG Timothy J. Maude Medal and now recognizes and sponsors the AG Corps NCO and Soldier of the Year with the SGM Larry L. Strickland Medal. Beginning in 2015, the AGCRA NEC approved and sponsors the Esther De Berdt Reed AG Corps Spouse of the Year Award. The award is named in honor of Esther De Berdt Reed, wife of COL Joseph Reed, the second Adjutant General of the US Army. This award is established to annually recognize the contributions of AG Corps or Army HR spouses and widows. In 2017 the AGCRA NEC approved the CW5 Daniel J. Logan, Jr. Medal for Distinguished Achievement which now recognizes and sponsors the AG Corps Warrant Officer of the Year. Mrs. Linda Logan viewed the medal and gave her concurrence. CW5 Logan retired from the Army in 2003 after a 32-year exemplary career. He was the Honorary Chief Warrant Officer of the AG Corps and was inducted into the AG Corps Hall of Fame in 2012. CW5 Logan passed away in June 2016. With the addition of these new medals, AGCRA now honors all Corps members of the Adjutant General’s Corps and Human Resources professionals: Officer, Warrant Officer, NCO, Soldier, Senior Civilian, Civilian, and Spouse. Detailed recommending procedures and all criteria for the LTG Timothy J. Maude Medal are found in the annual AG Corps Awards Program MOI. The MOI is normally distributed to major Army command headquarters and S1Net on or about in late summer of each year. Nomination packets are normally required to be submitted to the AG School at Fort Jackson, SC by February 1st of the following year (see MOI to confirm actual suspense date). Additionally, contact the AG School Operations Division, (803) 751-8300, if you need a copy of the MOI. The Chief of the Adjutant General’s Corps will appoint board members to select the AG Officer of the Year from the nominations received from the field. The Chief of the Corps will notify the winner, the winner’s chain of command, AGCRA, and provide an Army-wide announcement. 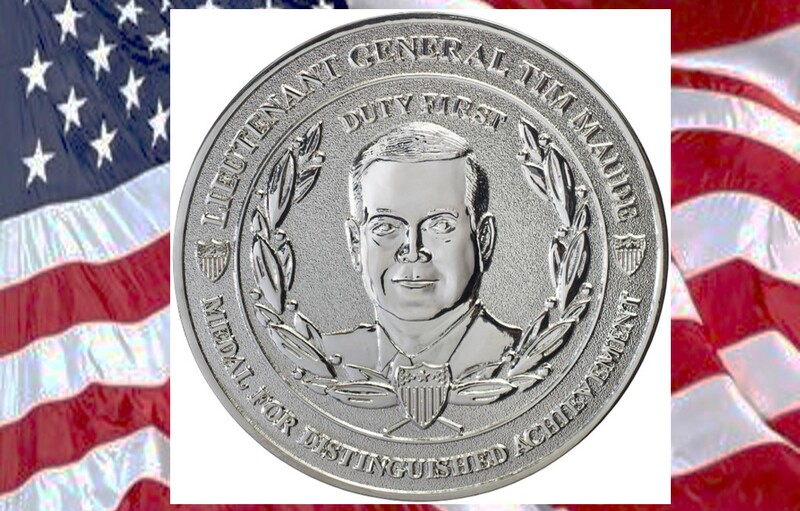 The winner will be presented the LTG Timothy J. Maude Medal for Distinguished Achievement during the Adjutant General’s Corps National Ball at Columbia, SC. All travel costs for the winner will be borne by the nominating command. The winner’s photo will be displayed at the Adjutant General School and the winner’s name will be added to the AG Corps Officer of the Year plaque hanging in the AG Corps Hall of Honor. Award recipient will be published in “1775″ and on the official AGCRA website.